Upgrade your LT1 car to a modern ignition system. Increased spark energy, extended optispark life. Benefits of the system are: extended opti life much stronger ignition at high RPM/boost built in adjustable rev limiter / two-step built in adjustable N2O / boost retard. It’s just plain cool. 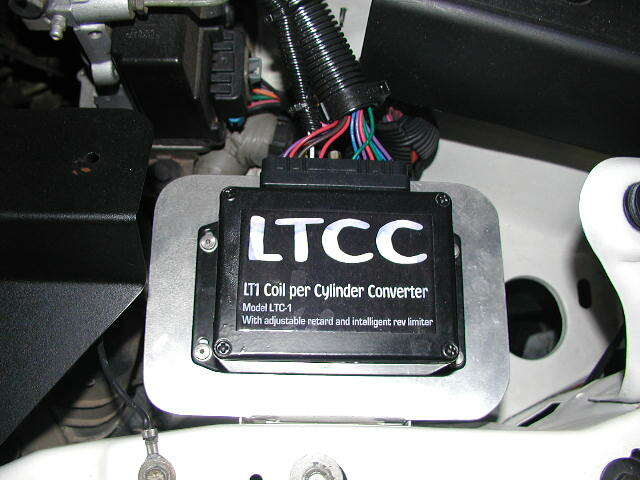 An LTCC kit includes the interface unit and harness. This harness plugs between the LTCC unit and OEM(GM) coil harnesses, not into the coils themselves. When shopping for coils, be sure to get the harnesses with them. Most sets of coils in the junkyards and on Ebay come with these harnesses. MSD coils do not work properly. LS1, LS2, and LS7 coils have been the best. LS2 coils (12573190) are very popular. We recommend Magnecor plug wires, an alternative is the Taylor SpiroPro wires. Magnecor wires generally need to be custom made for your application. SpiroPro wires can be assembled to fit. Use a Cut-yourself HEI kit and an LT1 terminal and boot kit.